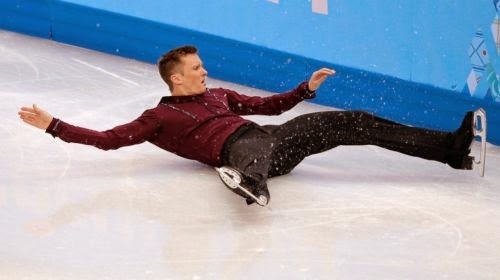 Last night, Jeremy Abbott, the American National men's singles ice skating champion, fell spectacularly on his first jump in the Olympic short program. It was, however, a fall that viewers could see coming a mile away. He fell during the same program in the team competition, and looked nervous beyond belief before he took the ice. He's getting credit (probably rightly) for a gutty performance in finishing his program, which included several more difficult jumps. The commentators expressed surprise that he could skate so well after such an embarrassing fall. But really, it ought to have been expected. Once the possibility of Olympic glory was gone, Abbott clearly felt a freedom that he hadn't felt before. There was no longer any reason to be nervous. He skated with a verve that wouldn't have been possible had his shortcomings not been so recently (and violently) exposed to the world. It is when we can look ourselves in the mirror and be honest about what we see: failings, sins, and shortcomings, that we can begin to live our lives with some measure of freedom. As long as we look in that mirror and tell ourselves that glory is possible (Olympic or otherwise), we'll be like Jeremy Abbott before "the fall": a nervous wreck. We'll be terrified of exposure, of failure...of being outed as frauds. Admitting from the beginning that we are a failure in need of profound rescue from the outside makes it all the easier to accept that salvation. Martin Luther famously said that the quest for glory could never be satisfied; that it must be extinguished. This is perhaps most clearly obvious during the Olympics. For every gold medal awarded, there are hundreds of athletes who leave with their arms in slings, their egos bruised, and their dreams crushed. In the same way, for every Mother Teresa, there's a you and me. Of course, our freedom is even better than Abbott's: our errors, our embarrassing falls, and our public disgraces have been given to a substitute. His perfect score has been given to us. We now live secure in the knowledge that when the judges (the Judge) regard us, they see only God's blameless son, Jesus Christ. The next time Jeremy Abbott skates that program, that fall will come back to him. He'll worry about it, and hope it doesn't happen again. Our falls can never come back to us. They were nailed to a cross 2,000 years ago. We, like Jeremy Abbott, have gone crashing to the ice too many times to keep telling ourselves that our quest for glory is ongoing. It's over. We've failed. Also like Jeremy Abbott, though, we're now free. We can live our lives without trying to fool anyone into thinking that we don't need saving. We do, and desperately.